Like Holland Village, Serangoon Gardens is a popular dining cluster in Singapore. 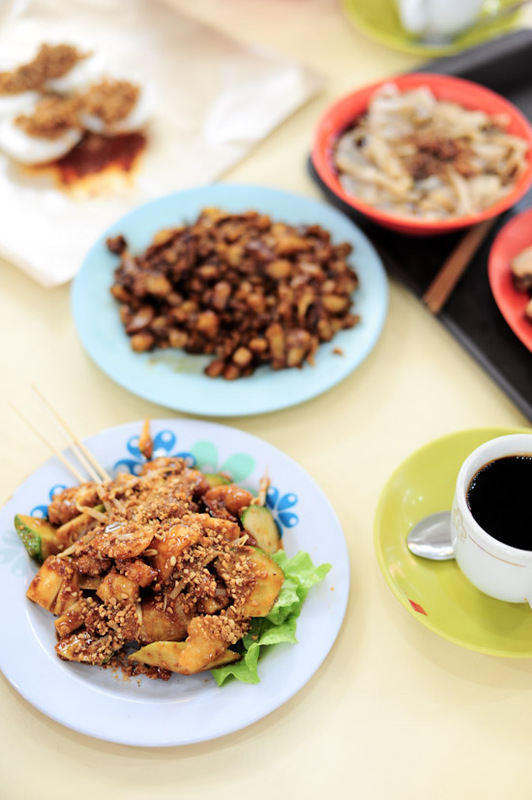 Beyond the many restaurants and cafes there, the estate has two popular Food Centre: Chomp Chomp Hawker Centre and Serangoon Gardens Market & Food Centre. I brought my overseas friends there and I realised that eating in Hawker Centres can be quite a daunting experience for visitors. It is easy for us as we are familiar with the Hawker Food. But overseas visitors usually do not know what to eat, and which stalls to order from. 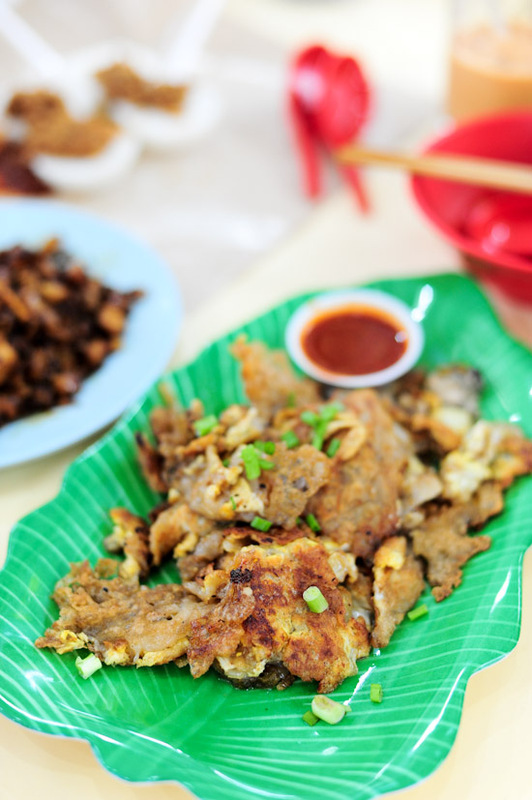 If you are bringing overseas visitors to Serangoon Gardens Food Centre, here is a quick guide on what to eat there. Amongst the stalls in Serangoon Gardens Hawker Centre, Ah Seng Duck Rice and Soon Huat Pig’s Organ Soup have the longest queue. I had them previously, but we did not order them that day. This was our second stop of our food tour, and we did not want to spend too much time queuing up for food. In any case, there were plenty of stalls to order from. We quickly filled the table with food: Rojak, Chwee Kueh, Popiah, Carrot Cake, Kway Chap, Ice Kachang, Wanton Mee, Oyster Omelette, and Curry Puff. I think Popiah is a fantastic food. It is the kind of thing you can eat as an appetiser before setting for a heavier “main dish”. Otherwise, it makes a great snack in-between meal times. 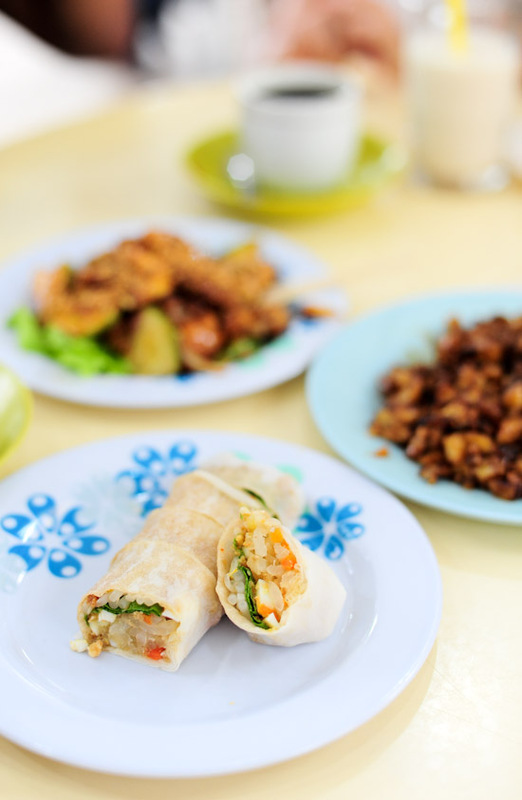 Popiah is an all-rounder, you can eat them anytime, anyday. The one that we had at Serangoon Gardens Food Centre was probably not the best, but still, it was quite satisfying. The Fish & Chips stall PX Express (by the Mad Jack Cafe) at Serangoon Gardens Market, serves a competent Fish & Chips, and their cakes are pretty decent too. 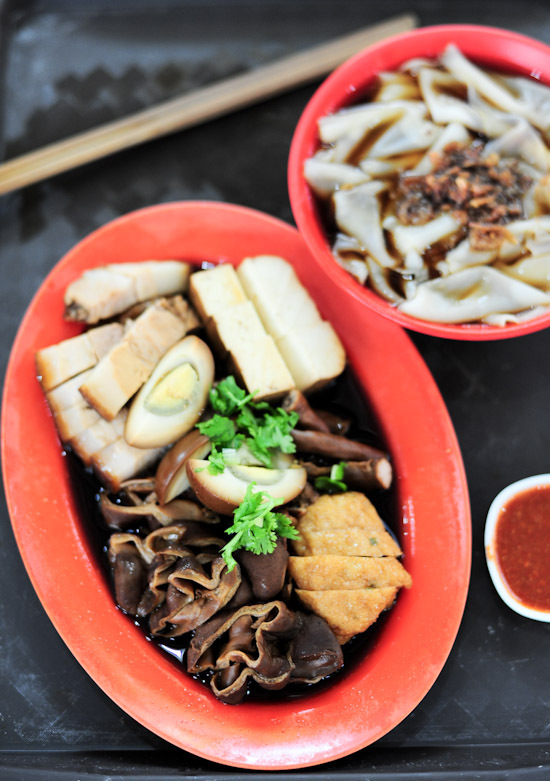 Right at one end of Serangoon Gardens Food Centre is the famous Garden Street Kway Chap. This is what I want for breakfast on a Sunday morning. Braised pork, pig’s intestines, braised egg, tau pok, salted vegetables with flat rice noodles – this is unbeatable. We also ordered Le Le’s Wanton Mee, but I was preoccupied with the Oyster Omelette. If you still have room, get the Curry Puffs from Rolina, and the ham & cheese bread from Serangoon Gardens Bakery & Confectionery. Trying to decide between Serangoon Gardens Market & Food Centre and Chomp Chomp Hawker Centre? It’s a no brainer. For the best of both worlds, go to the former for breakfast/lunch and the latter for dinner/supper. Perfect. Have been looking for the soursop juice in ex-hawker centre opposite botanical gardens for years. Any idea what happened to this stall?